Central Co-op Principle 7 is Concern for Community, and we have two programs to help make our products affordable to more of our neighbors. Living on a restricted income? 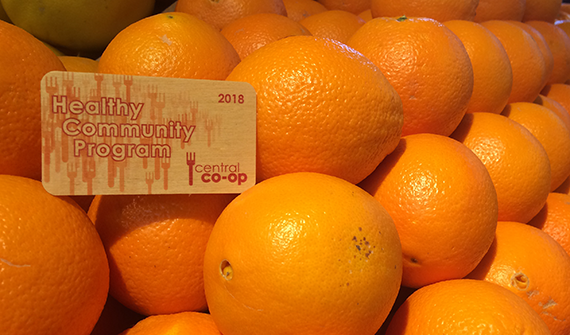 When you sign up for the Healthy Community Program you receive a 10% discount when you shop on Tuesdays and Thursdays. HCP is open to everyone, both owners and non-owners alike. HCP is an annual program, so even if you participated one year, you’ll need to sign up again and get a new card the following year. Stop by Central Services to sign up or learn more or email us for more information. Looking for amazing prices on everyday products? 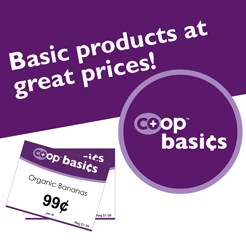 Look for products marked with a purple Co+op Basics tag! We've got staple foods, bulk goods, dairy, and other popular items at prices you'll love. Prices are good for all shoppers. Click here for a sampling of products and prices.